As Lewes resident Tom Paine famously said, “My country is the world… my religion is to do good” Today residents of Brighton & Hove and anti-racists from across Sussex will put this into practice as we come together to oppose the far right’s so-called “March for England”. It is at least ironic that this occurs as one of the most popular Britons ever, Mo Farah – a symbol of the benefits to our society of tolerance and multi-culturalism – runs in the London Marathon. 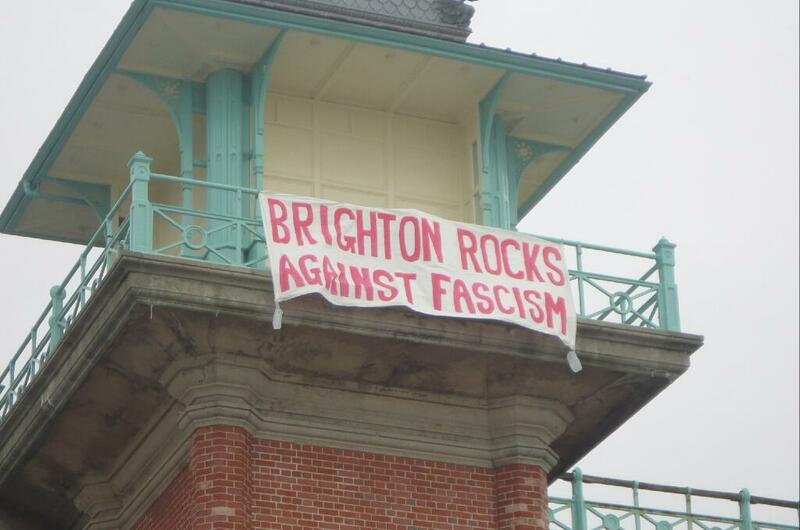 It will be to our shame if Brighton & Hove does not put on as great a display of unity in rejecting the racists this year, as we did peacefully and overwhelmingly in our thousands in 2012. Please join the protest against the racists marching through our towns. Meet from 11am on by the Palace Pier on Brighton seafront. Ignore the alarmist slant put on the statement by Sussex Police in our local rag The Argus. Last year many thousands of protesters witnessed nothing but joyous and peaceful rejection of racism. Indeed the day was by far the most uplifting and empowering occasion that most of us had ever participated in, as the racists were rejected by the people of Brighton & Hove standing united together. If you can’t make it to Brighton to join in telling the far right they’re not welcome here, then please sign the petition against racism. We reproduce the Brighton Unity Against Racism Statement below, which Sussex LRC was proud to help write and co-sign. “Brighton is a brilliant and vibrant city where many people of different cultures, backgrounds, abilities and faiths come together. It has a positive and unique character which its residents enjoy and embrace. Brighton people live here in the knowledge that they will be valued and that the things which make each individual different are celebrated here – not despised. We take great pleasure and pride in being surrounded by humanity in all its exciting diversity. Because of this it is very saddening to discover that the far right group March for England, which is a division of the violent and racist organisation the English Defence League, is to march in Brighton (in April 2013). When groups like this come to Brighton it is because our multicultural city in all its diversity proves that their own doctrine of hate is wrong, and they want to damage our unity. That is why we stand together: black, white and Asian; people of all faiths and of no faith; trade unionists; people of different political persuasions; University, school and college students; people of all abilities; whatever our sexuality. A full list of the initial signatories can be found below the statement here. Lastly, here’s something to keep you moving from 80s favourites Heaven17. See you at 11am by the pier.